A web browser warning that said the Daily Mail's website failed to maintain "basic standards of accuracy or accountability" has been changed. The newspaper had complained that the NewsGuard plug-in gave its Mail Online website a negative review. 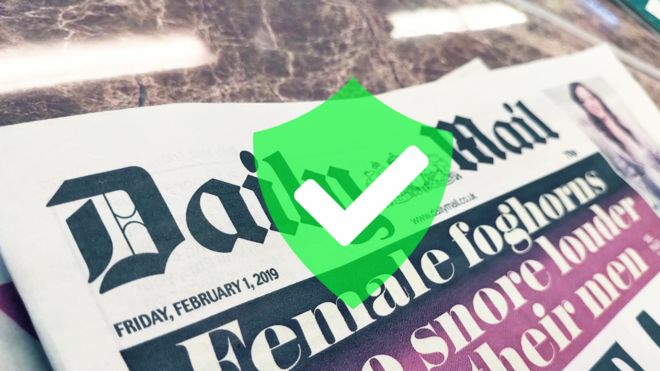 NewsGuard now gives Mail Online a positive green shield after discussions with a Daily Mail executive. But the company said Mail Online still failed to gather and present information responsibly. NewsGuard rates news sources to help people weigh up whether a website is trustworthy, or likely to publish fake news. Its ratings attracted attention in January after Microsoft included the plug-in with its Edge web browser for Android and iOS devices. A spokesman for Mail Online said it was an "egregiously erroneous classification". NewsGuard has now changed its review and says Mail Online "generally maintains basic standards of accuracy and accountability". It said it had originally considered how many complaints were made about Mail Online to the Independent Press Standards Organisation, but had not weighed this up against how many stories the website publishes. NewsGuard refused to change one of the ratings because Mail Online did not disclose "its conservative orientation". Despite this, the website now gets a green shield logo overall. The NewsGuard plug-in must be switched on by users of Microsoft's Edge app, but the BBC understands there are plans for it to become the default option in the future. The New York-based service - which is independent of Microsoft - also has ambitions to include its tool in further products from the Windows developer as well as other tech firms. It can also be used as an add-on extension in the desktop version of web browsers including Edge, Google's Chrome, Mozilla's Firefox and Apple's Safari.